Regular readers will be well aware of leptin as a key hormone secreted by fat tissue. Apart from its important role in appetite regulation, leptin has a number of other central and peripheral actions – one of which is to increase activity of the sympathetic nervous system. 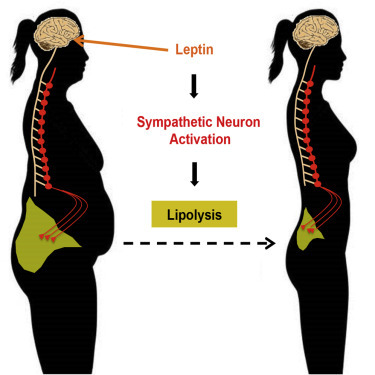 A paper by Wenwen Zeng and colleagues published in Cell, now provides conclusive evidence that leptin can mediate fat breakdown from fat cells and does so via stimulation of the sympathetic nervous system. 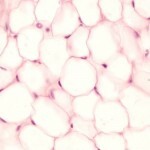 Using sophisticated nerve imaging techniques, the researchers show that fat cells are often densely surrounded by sympathetic nerve endings, which, when stimulated, lead to the mobilization of stored fat and a reduction in fat mass. Genetic ablation of these nerve endings or removal of the key enzyme involved in catecholamine synthesis completely blocks the lipolytic effect of leptin showing that the fat mobilizing effect of leptin is entirely dependent on intact sympathetic innervation and signalling in fat tissue. Overall the finding that sympathetic nerve activity stimulates lipid release in adipose tissue is not new – but the clear demonstration that his mechanism is harnessed by leptin is. 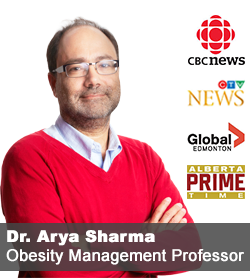 How this finding could possibly be harnessed for obesity treatment is difficult to say – while stimulating sympathetic nerve activity may well result in lipid mobilisation, it also comes with the feared adverse effects of stimulating heart rate and increasing blood pressure, which would likely limit the clinical use of any such approach. 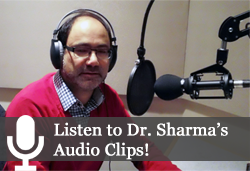 Of all of the common complications of obesity, fatty liver disease is perhaps the most insidious. Often starting without clinical symptoms and little more than a mild increase in liver enzymes, it can progress to inflammation, fibrosis, cirrhosis and ultimate liver failure. It can also markedly increase the risk for hepatocellular cancer even in patients who do not progress to cirrhosis. Now, a paper by Mary Rinella from Northwestern University, Chicago, published in JAMA provides a comprehensive overview of what we know and do not know about early detection and management of this condition. The findings are based on a review of 16 randomized clinical trials, 44 cohort or case-control studies, 6 population-based studies, and 7 meta-analyses. Overall between 75 million and 100 million individuals in the US are estimated to have nonalcoholic fatty liver disease with 66% of individuals older than 50 years with diabetes or obesity having nonalcoholic steatohepatitis with advanced fibrosis. Although the diagnosis and staging of fatty liver disease requires a liver biopsy, biomarkers (e.g. cytokeratin 18) may eventually help in the detection of advanced fibrosis. In addition, non-invasive imaging techniques including vibration-controlled transient elastography, ultrasound with acoustic radiation force impulse or even magnetic resonance elastography are fairly accurate in the detection of hepatic fibrosis and are the most reliable modalities for the diagnosis of advanced fibrosis (cirrhosis or precirrhosis). Currently, weight loss is the only proven treatment for fatty liver disease. Pharmacotherapy including treatment with vitamin E, pioglitazone, and obeticholic acid may also provide some benefit (none of these treatments currently are approved for this indication by the UD FDA). Futhermore, the potential benefits of existing and emerging anti-obesity treatments on the incidence and progression of fatty liver remains to be established. Clearly, screening for fatty liver disease needs to be part of every routine work up of individuals presenting with excess weight. 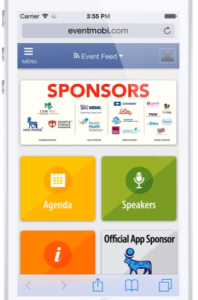 If you are planning to attend the 4th Canadian Obesity Summit in Toronto next week (and anyone else, who is interested), you can now download the program app on your mobile, tablet, laptop, desktop, eReader, or anywhere else – the app works on all major platforms and operating systems, even works offline. You can access and download the app here. You can then create an individual profile (including photo) and a personalised day-by-day schedule. Obviously, you can also search by speakers, topics, categories, and other criteria. Hoping to see you at the Summit next week – have a great weekend!